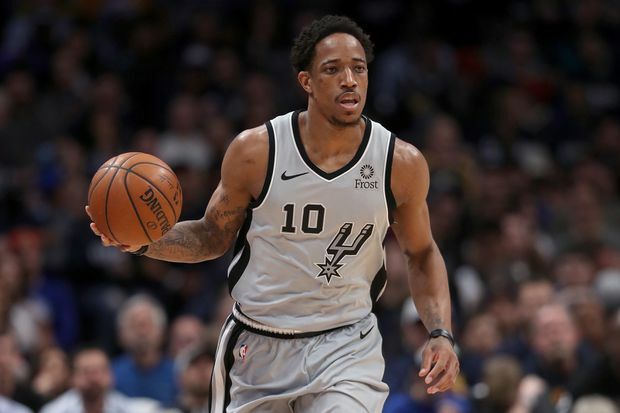 San Antonio Spurs' Demar DeRozan brings the ball down the court against the Denver Nuggets, at the Pepsi Center, in Denver, Colo., on April 13, 2019. Always a skilled scorer, the 29-year-old and four-time all-star has taken his game to another level in San Antonio by taking to the floor with a different approach – a get-teammates-even-more-involved approach. Gone are the days when he needs to erupt for 30 points to lift a team. The Spurs were 7-6 when he went for 30 or more. In contrast, they were 18-6 when he had eight or more assists. As for his three-point shooting, he only hit seven – his last one on Dec. 26 against Denver – as he took 242 less attempts than in 2017-18. The postseason hasn’t always been friendly to DeRozan. He went to the playoffs his past five seasons in Toronto, with one Eastern Conference Final to show for it. Before his arrival in San Antonio, DeRozan thought he’d seen just about everything in hoops. But he quickly realized one thing in working with Popovich – he hasn’t.